Is Super Mario World On The List of Nintendo 3DS Remakes? Mario creator and chief Nintendo fungineer Shigeru Miyamoto has given a firm "Maybe!" 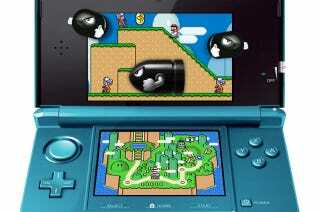 to that question, saying that a 3D revamped Super Mario World would be a "fun" fit for the Nintendo 3DS. In response to an IGN reader's question about the SNES original version of Super Mario World—"What aspects of the game would you have changed or added if you had been give more time? "—the man behind Mario had this to say. "Well, you know, actually a lot of the ideas that I would have liked to implemented in Super Mario World have come to life in later Mario games since then," Miyamoto says. "But the question gets me thinking about what fun it would be to create a Super Mario World game on the Nintendo 3DS and how we could use the depth and the sense of distance offered by 3D visual on the world map and on the maps in that game, so that you have Bullet Bills flying at you from a distance and popping up off the screen." "Is that a small hint?" the interviewer asks. "I don't know," Miyamoto says. "Maybe! (laughs)"
The original Nintendo DS brought about a remake of Super Mario 64 and later spawned New Super Mario Bros. Nintendo wasn't shy about remaking a number of 16-bit Mario games for the Game Boy Advance. Super Mario World 3D sounds like a good retro source to mine. At E3 2010, Nintendo had a bunch of "sorta 3D remakes" teased in a Nintendo 3DS demo on the showfloor. It also has a 3D Legend of Zelda: Ocarina of Time remake in the works and is digging through its back catalog for more 3D remake opportunities.